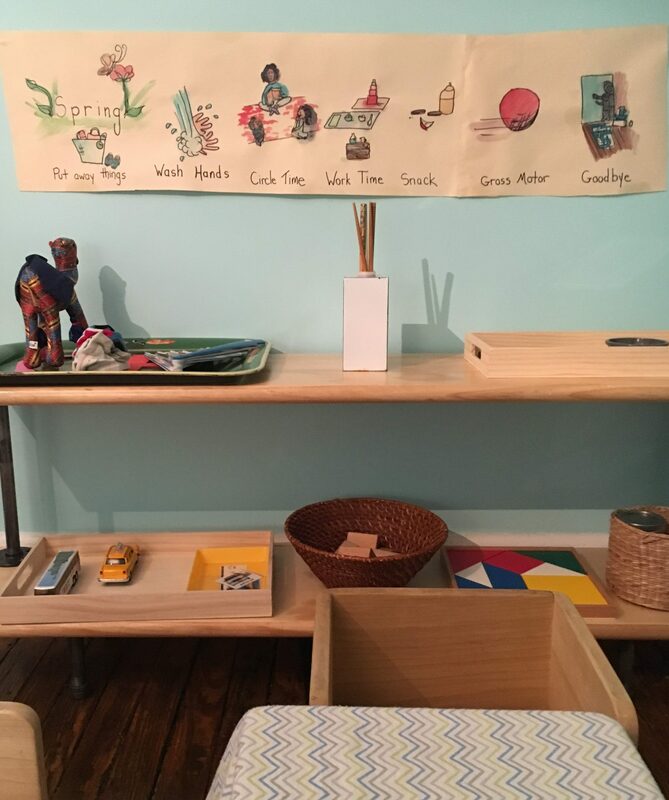 Setting up a workshelf for your toddler in a central place in the home is the first step to creating a prepared environment in which your child can learn freely. However, the Montessori at Home approach sees the entire home as your child’s first classroom. Anyone with a toddler knows that most often they want to be right where we are, getting into whatever work it is we are trying to accomplish. 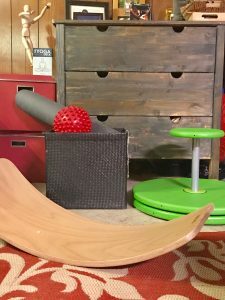 Many parents ask me, “How do I get my toddler to sit with something so I can actually clean up breakfast, do the laundry, write an email?” The answer to this is to shift from thinking of toys, games or screens to keep your child occupied, but rather to involve them meaningfully in the work of the home. By watching and doing along side you they are able to build vital skills of independence and self-confidence. 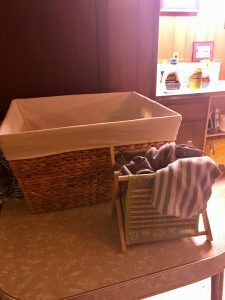 Guided by the Montessori-at-Home approach, I began considering each part of my home and the important work that happened there. 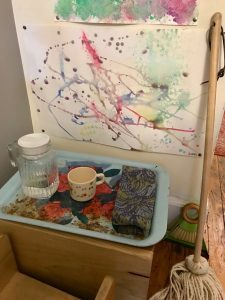 Once my son was fully walking and free to follow me and assist with his own hands (around 15 months), we created a small space in each room where he could get involved in child-sized versions of that work. Keep in mind, we live in a Brooklyn apartment and space is limited! These little work nooks can be fit into even the most compact home. As soon as you enter the home there can be a place for your child to participate in removing their shoes, hat and coat and putting them away. 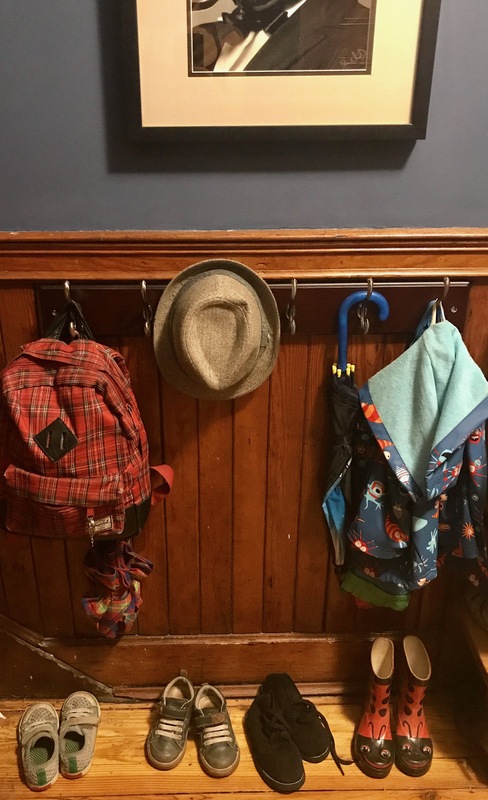 A coat rack mounted at the child’s level is perfect and will serve them for years to come. While every household has their own way, washing the hands upon arriving home is the proven way to keep germs out. Most sicknesses enter our homes on our hands and good old fashioned soap and warm water is still the best way to prevent the spread. 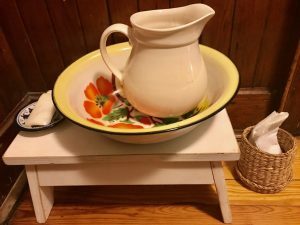 A simple handwashing station by the door includes a basin and pitcher, soap and paper towels. While your child puts away their shoes you can fill the pitcher with warm water and model how to wash hands together. This is especially useful for playdates with other parents and children! You can also serve snack at this table. A small broom should be provided for cleaning up crumbs. As your child grows he or she can participate in preparing and cleaning up snack – slicing bananas with an egg slicer, spreading nut butter on crackers with a child-sized butter knife and clearing dishes when finished. We all know the challenge of cooking meals and cleaning up with a toddler at our feet, pulling items out of the cabinets! 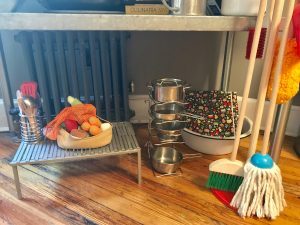 While I do recommend leaving a low cabinet or drawer with safe materials for this exploration, a child-sized cooking station is a wonderful way to allow children to mimic us in the kitchen when they are not quite ready to actually join in. Shown below are a set of IKEA cloth vegetables, Melissa and Doug pots, pans and cooking utensils and child-sized cleaning items. These have served us for years! On the right is a large basin and “splat mat” which can be spread out so children can help with simple food prep and clean up such as scrubbing a potato or two, rinsing vegetables or washing a few dishes. 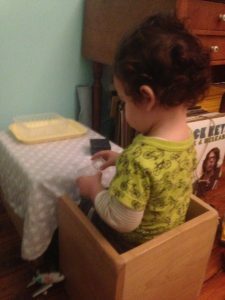 As an educational therapist, I did a significant amount of work from home all the way through my son’s toddler years. Setting up a corner with a low table and table-top work, including crayons, sensory materials and books, helped us both to engage in quiet work when I needed time on my computer. As children grow older they can be encouraged to spend more time at a desk and build their focus for fine motor activities. Especially if your child attends a Montessori school you will see them engaging in seated work for longer and longer periods. Very important work can begin in the bathroom around 15 months…yes, in the Montessori at Home approach this is when potty training starts. The first step is of course the prepared environment. A potty, accessible wipes and some good reading material is all you need. When you would normally change your child’s diaper, begin encouraging some potty time. 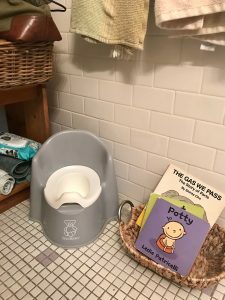 Sitting to read a book (we adored Potty by Leslie Patricelli) and modeling the process for your child makes the learning curve natural and even enjoyable. My son loved to sit and flip through books for up to a half hour at a time and the warm celebration he got for putting something in the potty provided all the motivation he needed to be fully potty trained – yes, in undies overnight – by age 2. Then there are all the other things we hope to accomplish while parenting a toddler…a workout, laundry, a random household task that pops up. Here are a few ideas for these spaces. Exercise does not have to end just because you have a toddler at home! In fact, working out together has always been one of my favorite activities with my son. I keep a child-sized yoga mat, balls and some big gross motor works in the downstairs den. Shown is a Waldorf balance board and the Whizzy Dizzy. A child-sized laundry basket can be filled with some of your child’s clothes so they can participate in loading the machine or folding alongside you. Finally, I can’t say enough about simply finding a spare drawer, cabinet or shelves in every room to place a revolving hands-on activity. 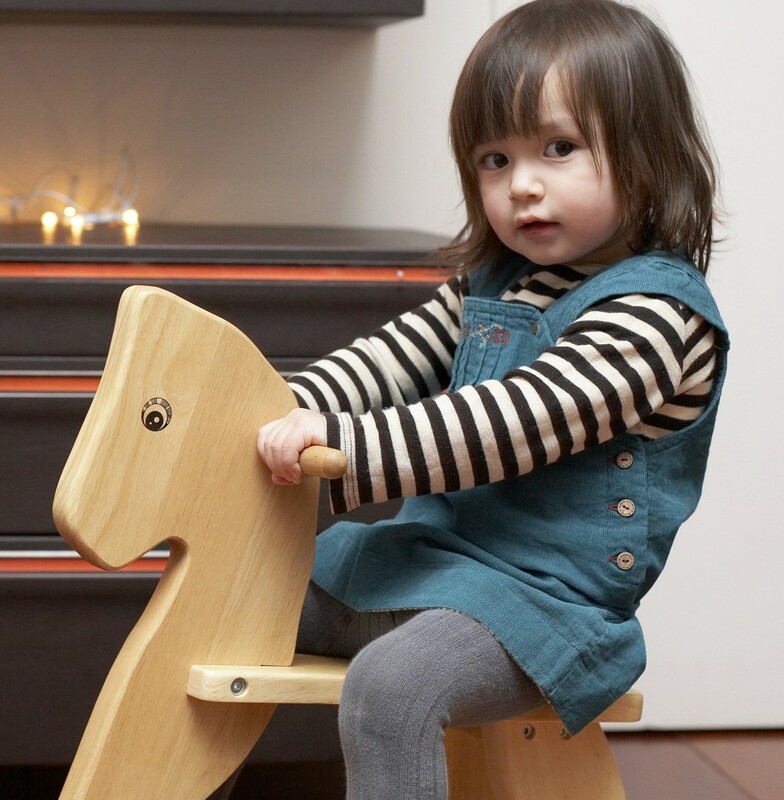 This allows for simple redirection to safe and purposeful activity wherever you and your child might be at home! I want to start by saying that I deeply respect the meticulous design of the Montessori materials and the training with these materials that Montessori teachers undertake to be certified. 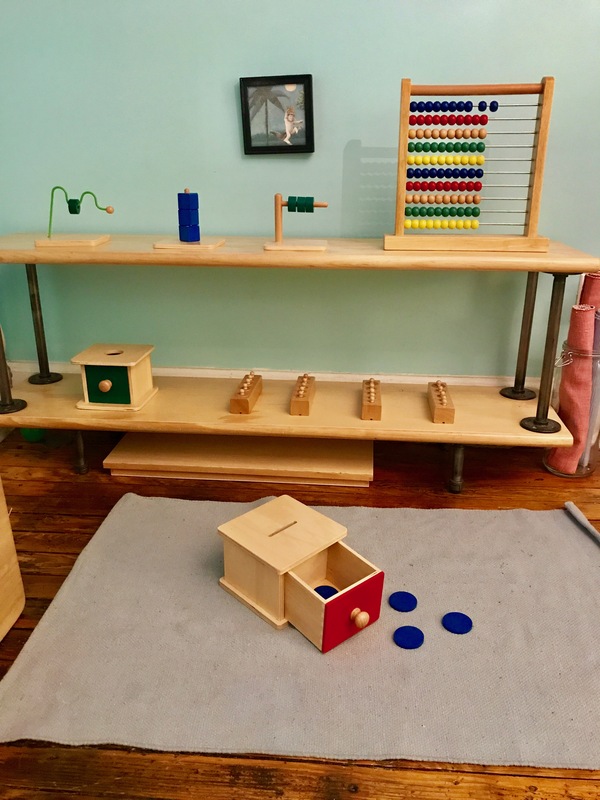 The Montessori at Home approach does not seek to emulate the Montessori classroom. Instead, we are finding ways to bring the approach into our own home space and that will naturally involve a certain down-home feel. Making is close to my heart as an early childhood educator and especially as one who embraces the Reggio Emilia approach for early childhood. A full discussion of Reggio is beyond the scope of this post, yet essentially it evolved in Italy at the turn of the century – around the same time as the Montessori Method. 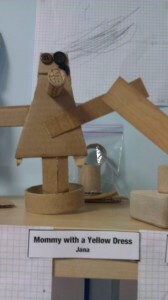 Reggio schools are all about recycled materials, sensory experience and learning through creation. There are many early childhood classrooms with curricula that draw on a blend of both Montessori and Reggio approaches. As a parent incorporating Montessori for your own child at home, making works also allows for an environment that is tailored and responsive to your child on a different level. Children are often intensely curious about funny items they discover in the home; boxes, sticks, strings and things can all take on new meaning in a child’s hands. By noticing your child’s interests in their environment and using some creativity you can make some wonderful additions to the work shelf with materials you already have available. These Sensorial Scent Jars were made from large salt and pepper shakers. They can be filled with a variety of smells using spices, herbs, or essential oils on cotton balls. One summer we did vanilla, strawberry and chocolate as an ode to ice cream! Another take on Sensorial, a set of Sound Cylinders. 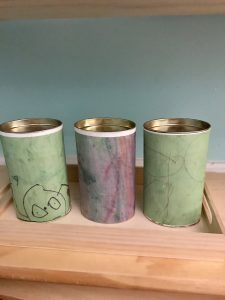 These began as recycled tea canisters and were wrapped in colorful paper. We filled these with dry leaves, rice and beans to create a range of sounds from soft to loud. 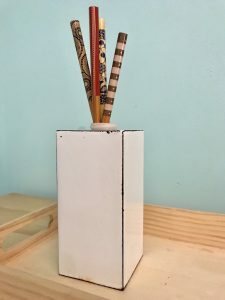 This Practical Life work, Chopstick Placing, gave new life to colorful chopsticks that had lost their partners and an old soap dispenser with a top that stuck. This task works grapho-motor skills as children try to insert the pointed end into an increasingly smaller hole. This Practical Life work, Yarn Pulling, was created by the teacher of our Montessori From the Start Playgroup who also happened to be a fiber artist. Children loved pulling the different textured yarn as far as it would go. 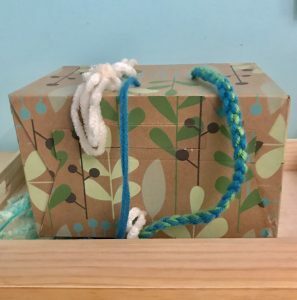 The yarn was threaded through the holes and knotted so that that turning the box provided never-ending opportunities to pull. 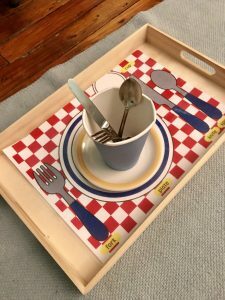 A paper cup, silverware, a play plate and a photocopied, laminated placemat become Place Setting in this Practical Life Work. I loved encouraging my son to practice setting his place at his small table with his own plate, cup and silverware. This Language work, The Color Pull Ball gave new life to play scarves and an O-ball from babyhood. 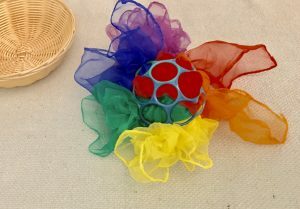 The tactile action of pulling the colors from the ball held children’s attention for just the right amount of time to name the color. Finding the correct color once the scarves were scattered about reinforced color names. Children in the 15 – 24 month range are in the naming stage of language. Simple word books are favorites and vehicles were all the rage in our home. This Language Work, Vehicle Matching was made by photocopying, cutting and laminating pages of a book. 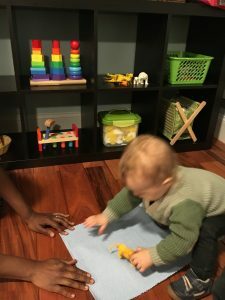 Naming and matching are important stages of language learning in Montessori and lay important foundations for expressive language and symbol identification. 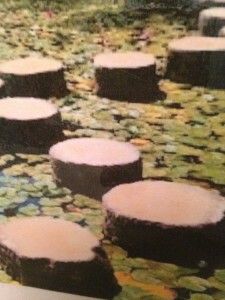 Later the printed word is removed from one of the pictures and a child can match it, using the labeled picture as a guide. These are called Three-Part Cards. This Math Work, The Counting Box, was made with cardboard and construction paper. It served as a way to practice early counting using any kind of small object that was interesting: buttons, beans, acorns, pebbles, pom-poms, sea shells. 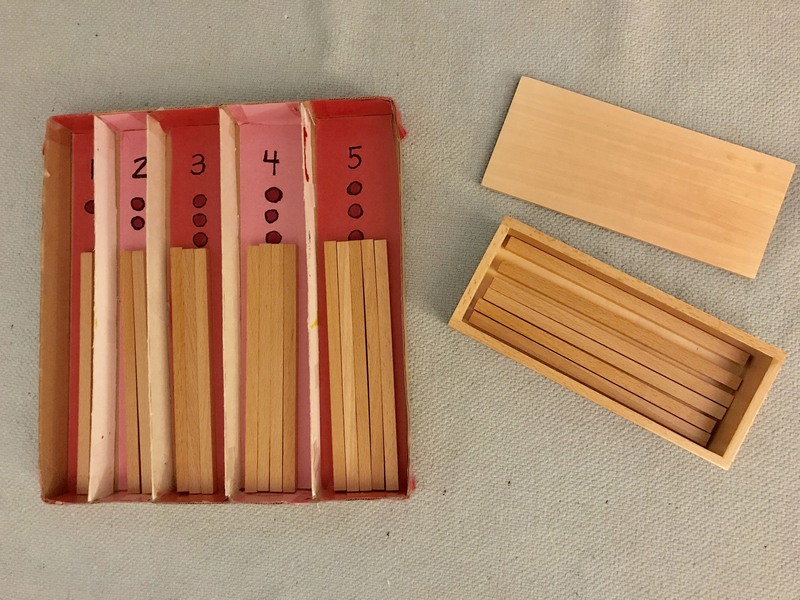 Shown here are the classic Counting Rods. I encourage you to use Pinterest to fuel your inspiration, there are a myriad wonderfully inspired ideas out there if you type in Toddler and Montessori. 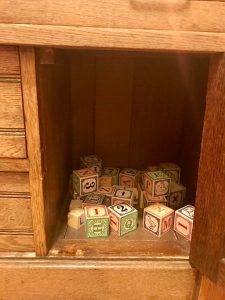 I also love the blog How We Montessori. So you’ve carved out a nook in the living room and set up your shelf. What comes next? 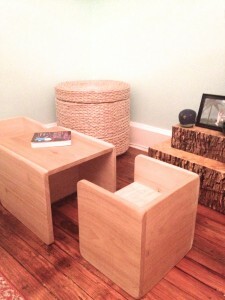 I do encourage you to select a few Montessori materials as an introduction for your child. Their addition to the shelf will naturally invite curiosity and the works are carefully designed to be just that. They are simple and purposeful – and are decidedly not toys. DO make sure that your child is gently guided to roll out a work mat, bring each item, one at a time to the mat, and then return it to the shelf when finished. This cycle of activity is just as important as the work itself in terms of building a young child’s executive function skills, including initiation, planning, sequencing steps of a task, focus, impulse control and goal-directed persistence. DON’T become over-involved in your child’s work. This space is your child’s and as a space needs to be respected. Once your child is set up with a chosen work, busy yourself if possible with your own work. There is no need to jump in when your child is struggling. Let them exert effort and build stamina. If they begin to show frustration by shoving or banging materials, gently suggest that it might be time to make a new choice. When they do complete a task successfully you can of course notice but try not to praise. They should be seeking their own internal satisfaction rather than yours! If you had to pick just a few Montessori materials for your 15 – 24 month old these would be some of my top choices. 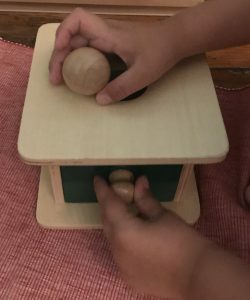 This set of Sensorial materials builds concepts of object permanence, fine motor skills from full hand grasping to pincer, opposites such as open/close and vertical/horizontal. Work with the materials is rich in descriptive language and early counting skills. These works are widely available online. 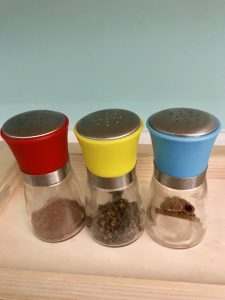 There are discount Montessori retailers, though I recommend quality sources. If you are looking for the best quality, Nienhuis Montessori and Gonzaga Arredi make their materials directly from AMI blueprints. Less expensive options include Montessori n’ Such and Kid Advance Montessori and FAC Montessori, the latter two available on Amazon. Keep in mind that I purchased these for my son when he was a year old and he used them consistently for years. I have them carefully stored for my next child. We all know how children around 15 to 20 months love to take things out and put them back in! 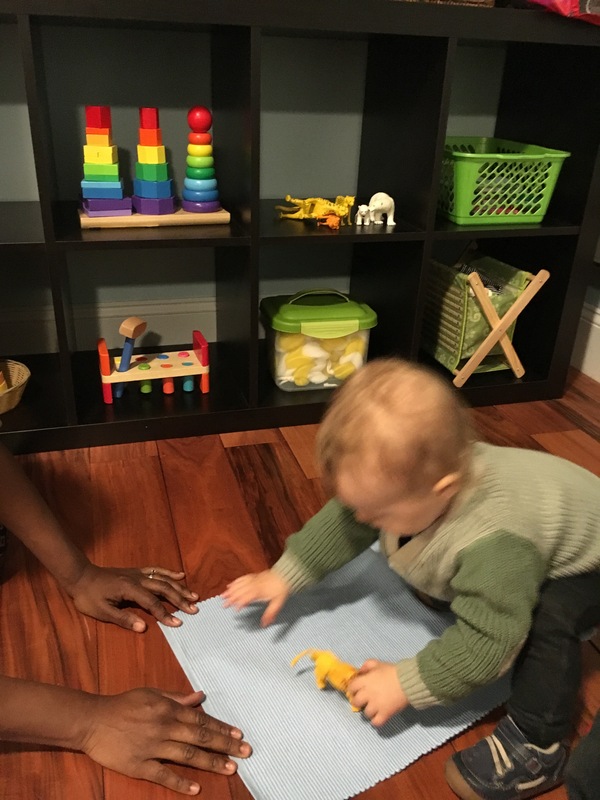 This is developing the important concept of object permanence, as well as the full hand grasp and hand-eye coordination. This work extends the concept of object permanence from a single ball to a set of five coins. It requires slow and deliberate motion of the hand and adjustment of the wrist and fingers to line up a coin so it drops into the spot. I clearly remember my own son sitting for nearly half an hour at a time with this box as he mastered the skill. It is fascinating to watch them experience the satisfaction of a smooth drop, discover the the coins inside the drawer and notice when one has wandered off the mat. Success requires a delicate pincer grasp to move the ring along the dowel and builds the skills required for free posting. This represents the next level, maneuvering a small object onto a post. 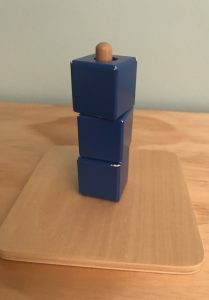 Unlike large stacking toys this builds on the pincer grasp as the cubes are about one inch wide. Great control is required for younger children. Counting one, two, three as they place the cubes is a helpful way to offer encouragement. This requires a new way of thinking in order to slide the rings from right to left without the holes visible. It takes quite a bit of skill and coordination! We will break for the weekend. Next week we will discuss some DIY additions to the living room work shelf inspired by creative Montessori-at-home parents. When friends or parents discover that I am a Montessori mom the first question is inevitably what activities they can do with their child to begin building in the Montessori-at-home approach. When is a good age to start? 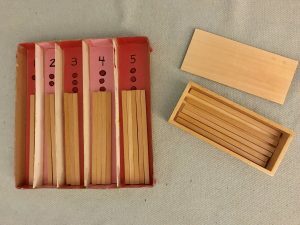 What Montessori materials are a must? Do they have space in their Brooklyn apartment? This two-week series will explore this question and will seek to answer it in a way that is simple, straightforward and ultimately doable in the joyful chaos that is parenting. We will take it one day at a time…starting today! 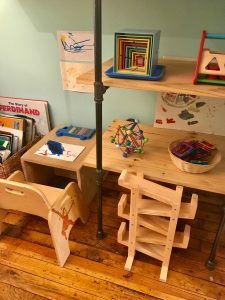 As director of Neuleaph Early Learning over the course of three years, I had the task of consulting with the parents who volunteered to host our playgroups to incorporate a mini Montessori environment into their home. These homes, each lovely in its own way, came in various shapes, sizes and styles. The goal was always to use as much of what parents already had in their home as possible and to stay within their unique aesthetic. 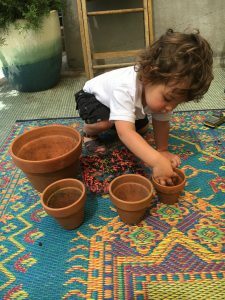 Of course Montessori is a way and a language, yet some basic preparations of the environment are necessary. The prepared environment represents the structure within which a child is given freedom to work. This balance of freedom within structure is at the heart of the approach. The very first step is to consider each room in your house and what important work and play happens there. Then create child-sized space where your own child can participate in practicing the skills of this work in a simple and meaningful way. It makes sense to begin of course with – what else? – the living room. 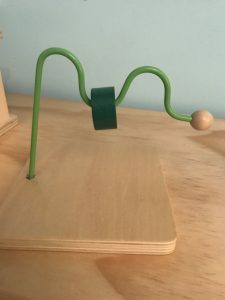 Rather than allowing your child’s toys to drift out all over the home, a small shelf in the living room serves as a place for a rotating set of works chosen for your child’s interests and burgeoning developmental skills. The shelf need only have two levels, enough to fit about six to eight works. It should have an open space large enough for a child to sit comfortably before it and should be accompanied by a container holding large and small work mats. Small framed pieces of art or a daily schedule hung at a child’s eye level can complete the sense that this corner is just for the child. 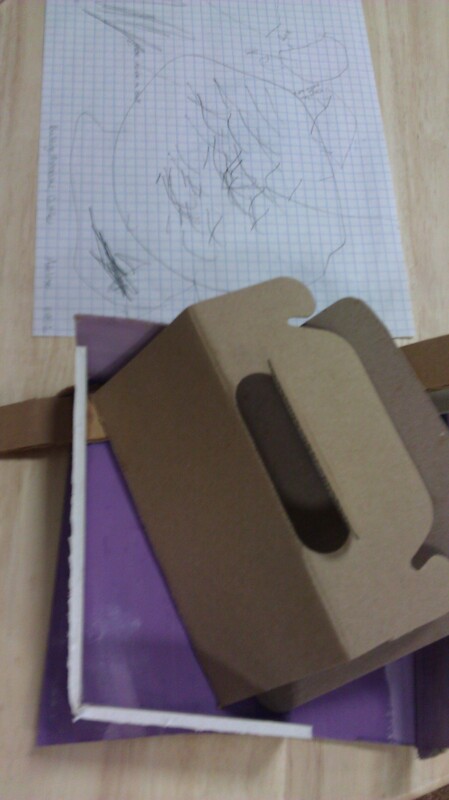 A child-sized table nearby is ideal. You might choose to use a low coffee table for standing work – added incentive to keep the table clean and clutter free when not being used for a specific purpose. I personally love the classic Montessori wooden cubes which can be a chair or table for children learning to sit with sides that support. These can be purchased on various sites though I recommend a search in Etsy for the best quality. Tomorrow we will explore what to put on this shelf! 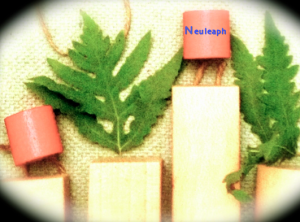 Neuleaph Early Learning has had an incredible first year in BK… and our second year is off to a wonderful start! Email neuleaph@gmail.com to learn more! My last post told the story of Tess, and how she inspired my investigation into mindset in the early childhood set. The natural follow up is how what I learned about her mindset affected the way her teachers interacted with her and subsequently her experience in the classroom. And how was this, in turn, reflected in our teaching approach? We met and read Tess’s story. We pondered the metaphor of the Little Horse for her and what it meant that she didn’t want to wear a saddle, carry a rider or go to the race. We all agreed that if Tess were pushing herself to take risks she would grow and blossom as a learner. Once she was engaged and confident in the classroom, we felt her cries for attention and her venting frustration through difficult behavior would likely fade out. But: if overcoming challenges and growing stronger is not a child’s natural motivation, then how do we get them to take the risk? For one, language is key. Rather than focusing on the reward a prevention-minded little one will get if they take on a challenge, frame things in terms of what they will lose if they do not. We considered how this might translate to our work with Tess, both academic and social/emotional. The Tinte Blocks were one of her favorite works, yet she resisted a teacher’s support when she could not recreate the three dimensional constructions of her peers. Neither would she join in to watch and learn. She worked alone, grew frustrated and sat fiddling idly with the blocks. And so, I sat beside her. 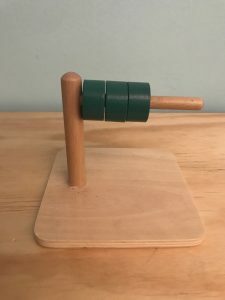 Rather than urging her to show her peers what she was doing with the blocks with mustered pluck, I said, instead: “Tess, I noticed that these girls are waiting to use the Tinte Blocks. You can say you want to work alone, but if you do you won’t get to see how Josie and Juliette make those square houses. You might not get to learn how.” She didn’t leap right away, but she didn’t shrink back. And some time later she began joining in. While she still needed a teacher to hang in with her in these initial social interactions, to remind her, when she veered toward prickly behavior, that if she acted that way the other kids would leave, she began to respond, to temper herself and let her social curiosity take over. At the same time we took a new approach to her frustrating behavior during meetings. Rather than pulling her aside before gathering on the rug to encourage her to keep her shoes on and stay in her spot, we took a different approach. The teacher leading would establish the ground rules for everyone, and Tess would be given one reminder. She knew if she chose to sit in the center of the rug and take off her shoes she would miss out on getting to perform the special job we had waiting for her. Her choice. It would go to someone else, the opportunity lost until the next day. When we reviewed her progress after several weeks it was agreed upon. Tess had turned a corner. Like all matters of development, things did not take a purely linear course and there were bad days. Yet the good days prevailed and soon we were getting reports from home that she had risen to new levels of maturity and calm. Over the slide from spring to summer we saw her find her place in our classroom community. Put down roots. Blossom. The next fall, Mindset stories became part of the Blue Room curriculum. Baby Owl made his appearance in September. I watched and observed the first two weeks. 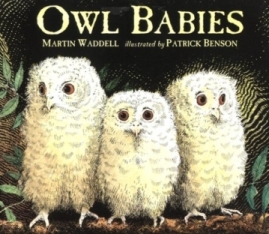 The children, most of whom at two were dealing with some pretty intense separation, were very interested in the book, Owl Babies by Marin Waddell, a classic for the littlest preschoolers. 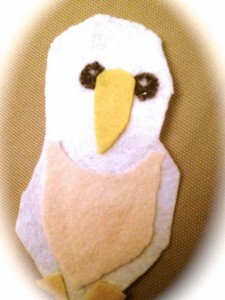 Baby Owl was simply constructed as felt, and was presented as a provocation one day, with a larger Mama Owl and some picture cards. 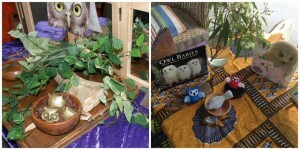 As an unexpected testament to the book, when searching for a good Reggio website to explain the term provocation, imagine my surprise when I happened across this website and saw a similar Owl Babies provocation in the first two photographs! 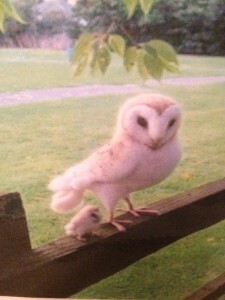 Once there was a Baby Owl and a Mama Owl. They lived together in a cozy hole in a tree, lined with warm, soft feathers. They ate and cuddled. So the Baby Owl waited for Mama for a long time and then she finally came back and they ate lots of grubs and went to sleep. 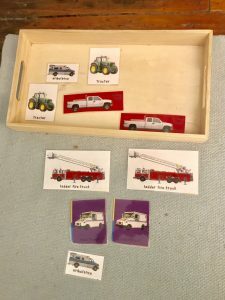 At each point in the story, the child is able to make a choice, and, if she chooses, the next picture card is flipped and the story moves on. The project was fascinating. By the second week children were elbowing each other aside to take a turn at the Baby Owl table. The results of the project? This post is too long, that’s the next one! The story of the Little Horse was a project that I conducted with all three classrooms at the Red Hook Playgroup in the spring of 2013, as part of my work as the Developmental Support teacher. It all began with a little girl in the Blue Room, our 2’s classroom. I will call her Tess. From the start of the year she had been a bit of a puzzle to us. Curiosity shone behind her deep brown eyes and yet she shied away when a teacher approached her mat to ask about how she was exploring her materials. 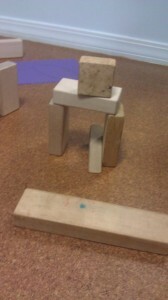 In response to questions about her stack of cubes she might topple it and scatter them. As we made our way to mid-year, Tess became a topic at our Developmental Support meetings. While other young students settled, as they tended to do in our open-choice classroom, on a repertoire of work that both challenged and satisfied them, Tess seemed to confine herself to activities that were too easy. She might spend whole mornings with the same tinte blocks, even after her interest had clearly waned, refusing invitations to join other work or try something new. We could see her interest in the work around her and yet she grew quickly frustrated when her first attempt to replicate something her peers were doing failed. She would give up, resisting help and becoming restless and distracted. It was my role to spend time observing and working with Tess closely in search of the hidden hinge that would open her up, motivate her and put her in touch with the environment – our third teacher – in way that would ignite natural engagement. I invited teachers to pose questions, and to look over Tess’s artwork, stories, notes from her free play, looking for clues to why she was not motivated the same way that her peers were – and how we could find a way to change that. The image of a horse came up over and over in Tess’s work. She drew horses, she wrote stories about them, she liked to pretend she was a spirited horse on the playground and in the classroom, tossing her head and kicking her feet, often kicking off her shoes. When asked to sit at the edge of the rug, she would prance sassily to the center of the circle and rake the rug with her hands. And, like a spirited horse who refused the saddle, Tess made it clear that rewards and praise were simply not going to work to motivate her. She was trying to tell us something about herself through her behavior. Thus Tess was the primary inspiration for the story of The Little Horse. The project really took shape when I attended a Learning and The Brain conference at Columbia University on Student Mindset and Motivation that spring and heard Heidi Grant Halvorson speak. 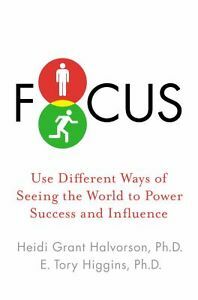 Her research, described in her book Focus: Use Different Ways of Seeing The World for Success and Influence, explored a different mindset framework: a promotion focus versus a prevention focus. Promotion-focused people tend to see goals as opportunities go gain something. They have lofty aspirations and are willing to take risks to achieve grand objectives. They seek positive feedback and can become deflated without it. Prevention-focused people on the other hand tend to think about goals in terms of what they might lose if they don’t achieve their objectives. They tend to try to avoid mistakes and losses. They can be uncomfortable with praise or optimism and feel worried or anxious when things go wrong. Unlike Carol Dweck’s Fixed/Growth Mindset model, this framework represents a spectrum on which people fall but neither end is seen as better or worse. These mindsets are shaped by early life experiences and become part of who we are and how we approach challenge. Both can be used as strengths – but often classrooms are polarized toward the classic promotion mindset. I began considering this in light of Tess. These dual mindsets certainly seemed like an important factor to consider when something wasn’t clicking with a student in the classroom. How might I assess where children were on this mindset scale? This story is about a little horse who goes to school. Since she is a little horse, instead of going to school in a classroom she goes to school in a meadow. Instead of learning letters and numbers she learns to wear and saddle and let people ride on her back. This morning, like many mornings, she is down by the river with her teachers because she ran away from the others. She doesn’t want to wear a saddle or let people rider on her back. She wants to play and run free in the meadow. I asked each child in the school to tell me what they thought the Little Horse should do. My questions were: What directions would this story take? How would younger children answer differently than older children? And finally, How would different developing mindsets (promotion vs prevention) be represented in children’s answers? Childrens’ stories school wide settled in categories, most falling into two conditions I called Stay in the Meadow and Rider, Race, Reward. They identified with the Little Horse, and had very clear ideas about what he or she should do. Some children had the Little Horse taking on the challenge of learning to accept a rider in order to reach the reward. Others had no interest and were happy to stay in the meadow. No, she doesn’t want to be a racehorse. She wants to be free and run in the meadow. ‘No, N. O. No. You have to learn to steer people on your back.” She’s not going to listen. She stays in the meadow until she’s big! Needless to say, she lined up with a prevention mindset. The chart below represents the effect of children’s ages on the mindset represented in their stories. Blue Room children were 2.5 to 3, Green Room 3 to 4 and Purple Room, 4 to 5. Certain trends are apparent. 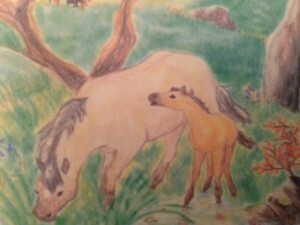 The number of children who chose to have the Little Horse stay in the meadow falls as children mature. 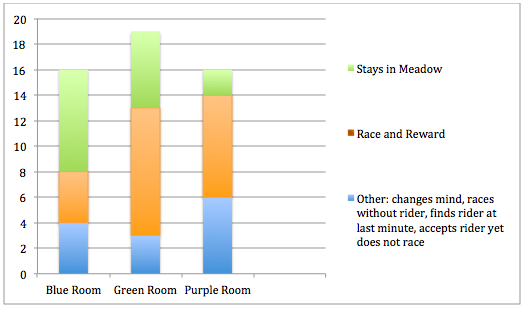 The number of children who chose to have the Little Horse accept a rider, race and win the reward swells in the 3’s classroom, and then falls a bit in the 4’s/5’s as independent thinking introduces unique outcomes, which were more complex and nuanced. These outlier stories were fascinating in and of themselves, though this is a topic for another post. 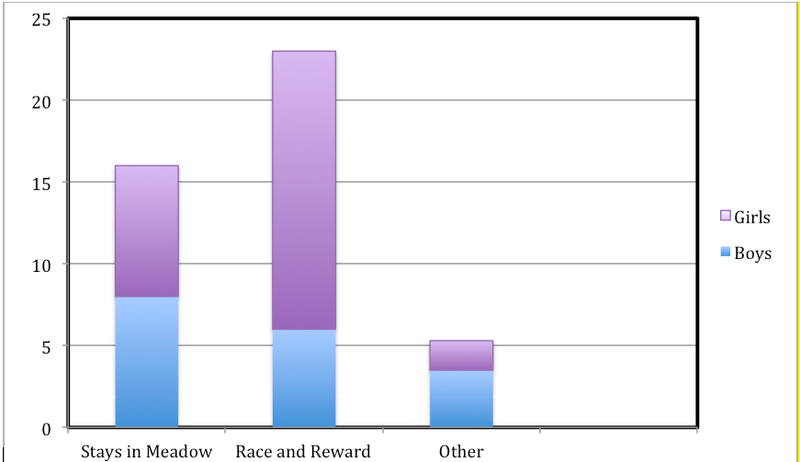 Another interesting trend that emerged school wide was the gender split for the Race and Reward category. As many teachers know, boys as a group pose their own challenges when it comes to engagement, motivation, attention and behavior. Especially in early childhood, “boy energy” is often seen as an obstacle to a well-executed lesson plan. It is easy to see here that, while there is a half-and-half divide for the Stays in the Meadow Category, Girls chose Race and Reward two to one over boys. Is it possible that we as teachers are missing an opportunity when we do not consider a child’s mindset? How can my findings from this project be applied to the classroom? 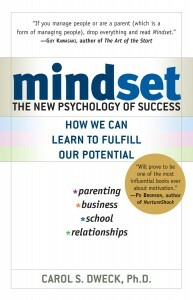 Check back for the next post in this series which will explore the idea of mindset stories in more depth. The flurry of September is over and teachers and students are getting down to the real project of learning. I know this even though this is the first time in eight years that I have not watched a whole new set of small people enter my classroom and wondered what would ignite them. Even though I now see my students after school, just the two of us, at a single desk in their bedrooms, I know. Ahead there will be triumphs and mistakes, successful projects and things that are just not working, tight schedules and scrambles to prepare – and an amazing amount of growth happening in millions of minds. Seeing one’s intelligence as a fixed trait causes a learner to shut down in many ways which blossom when the same child is taught the truth – that our brains are plastic and by their very nature grow stronger with hard work and practice. Since then, a child’s mindset has been my first focus when beginning a new working relationship – and over and over I have witnessed what happens when a young learner relaxes into the idea that they can grow. Where before the presentation of a challenging activity caused shrinking back, silly behavior or disengagement, now the child honestly remarks that they need to work on a skill or points out how much better they have become with practice. They begin to reflect on the next level and wonder just what they might be capable of. Just this evening I listened to a young boy I had begun work with when he was three – he just began kindergarten – read. In a clear firm voice he read his way down a page of sentences and remarked, “I can really read – this is easy!” I thought back to when we first started, a little over two years ago, when he was all over the room. I had to tread carefully and introduce challenge very gently. He would become very frustrated when asked to write his name, claiming he wasn’t good at it. He’d been shouting too much in frustration – his voice was raspy and harsh and his speech therapist was urgent that he must stop. He didn’t know many of his letters – and the truth was, he didn’t want to. Little by little, as I pointed out his strengths – his strong number four, the wonderful way he could draw a ship – and agreed honestly with him that his letters did need some work, something happened: he began to try. He tried and he noticed what happened, and I showed him how he grew a little bit each time. Tonight was a big one. I could see that he believed me. I have found that my relationships with my young learners become more natural and authentic when we are both aware of the areas that are strengths and those that need to grow. Rather than pushing my students to do something that feels “too hard” we wait until we both feel excited and motivated by the opportunities for growth. Rather than falling into the trap of empty praise – the ubiquitous “good job!” that slips out so easily when teaching, I can frankly point out the places where new growth happened and the growth is its own reward. In the meantime, Mindset has become a hot topic. In the last few year it has popped up everywhere in my work – it was the theme of a newsletter to parents at a client’s school last spring, a topic for discussion at an info session attended for a new Mind, Brain and Education based school currently in development in Brooklyn, the focus of my professional development conference and subsequently the topic of my two-year school-wide mindset project I conducted with preschoolers at the Red Hook Playgroup. More to come on this project as I continue to explore mindset and what it looks like on the ground in my actual work with children in upcoming posts. It is mid-morning and the classroom is buzzing with the steady hum of open work time. Three-year-old Hannah is at work at the atelier. She is drawing a plan for the owl she is going to build in the block area. 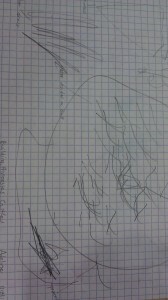 The drawing has triangular shapes and tight parallel scribbles . 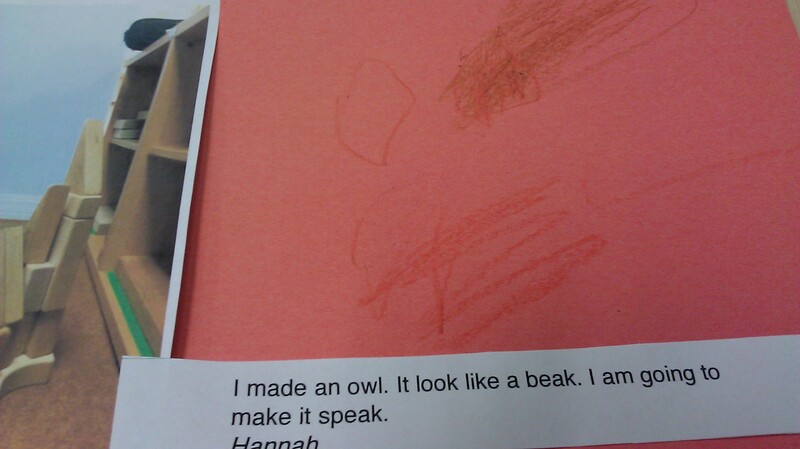 “I made an owl. It look like a beak. I am going to make it speak.” Then she gets to work, building the owl from blocks, fitting several triangular pieces so that they poke jauntily up from her construction. 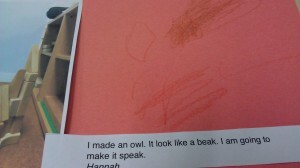 When I see the drawing later, beside a photograph of the finished construction I have taken for upcoming curriculum night, Hannah’s owl does speak – and the message is powerful. After a mere three years of experience in this world, she is capable of an incredible feat: the ability to take a purely abstract concept and recreate it in the solid material world. This ability to conjure and then construct, to imagine and then to realize, is the ability we call creativity. Creativity has received much attention in the field of education lately. Sir Ken Robinson, head of the British government’s 1998 advisory committee on creative and cultural education, is something of a creativity expert. After all, he was knighted in 2003 for his achievements as the leader of a wide body of research on the significance of creativity in the education system. He makes a simple point: the majority of students in our current education system are failing at achieving successful lives and careers because, all over the world, cognitive and academic abilities are valued over creativity. I encourage you to pay a visit to TED.com to learn more more about Sir Ken Robinson’s brilliant work. What does educational neuroscience have to say on the subject of creativity? Dr. Paul Howard-Jones, a leading expert in the role of neuroscience in educational practice and policy, has conducted ground-breaking research over the last ten years in neuroscience, (Howard-Jones et al 2005); developmental psychology, (Howard-Jones, Taylor and Sutton, 2002); and neuroeducation (Howard-Jones, 2002), identifying ways to use new scientific understanding of creativity to form strategies for fostering creativity in the classroom. In 2008, Howard-Jones and his team began a large-scale project in the UK to co-construct an understanding of creativity in education that draws on neuropsychological concepts. The results were presented in a publication titled Fostering creative thinking: co-constructed insights from neuroscience and education. You can download a pdf of this publication in Neuroeducational Rescources. The publication asks a key question, one that I have set out to explore this year. Given that creativity is recognized as a capacity vital to a student’s success and should be treated as such in the classroom: Can creativity be taught, and if so, how? Howard-Jones presents some clean facts, well-supported by quality neuroscience findings, on fostering creativity in the classroom. I would like to review these against the backdrop of the Reggio-inspired arts curricula that have developed in my own classroom this year. We’ve just arrived back from the playground, and my students are choosing their work for the morning. We’ve begun something new in the blocks this week. Instead of simply asking children who choose the Block Area what they are going to build, teachers are inviting children to draw a picture of their rocket ship, racetrack, seahorse and rain forest first. Detailed drawings emerge at the atelier table, with lines and shapes that convey direction and movement. Students eagerly offer descriptions about the parts of their blueprints, the height, size and angles of the constructions in their mind. It is their own idea to bring their plans into the block area with them. Some revisit the plan as they work, others build directly on top of their drawings. According to Howard-Jones, one way that teachers may play a pivotal role in the fostering of creative thought is by supporting a child in learning to move between modes of generative and analytical thinking as they engage in creative activity and projects. We know now, in both neuroscience and education, that ideas of the Left/Right brain being divided respectively into logical and creative are outdated and misunderstood. Hot spots of activity in the brain appear all over a scan taken during a creative task. Recent research (Howard-Jones et al, 2005) used fMRI to look at the brains of subjects as they were engaged in creative story generation. A key finding was the way that the type of thinking varied between freely generating ideas and connections, and then returning to analytical assessment of the story so far. In other words, the process of purposeful creativity involves frontal areas that are associated with conscious control. Supporting creativity in very young children is a controversial topic. There has been much debate on the necessity of the teacher’s role. Children are already so creative naturally, isn’t it best to just stand back and let them have free, sensory experiences? Yet, it is clear to me that even my young students are able to employ both of these modes of thought during a creative project. 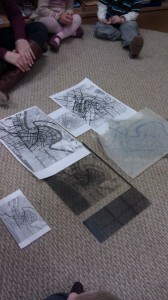 The drawing, planning and and discussion ends up being as much a part of the process as the making. 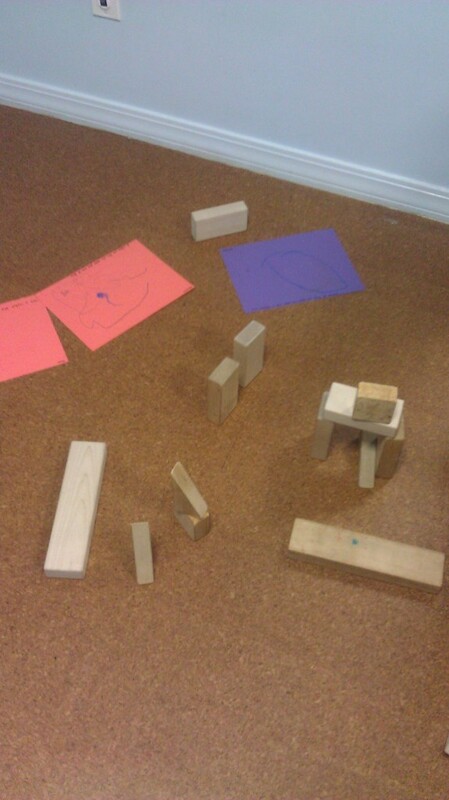 Beginning block building at the atelier table becomes a welcome habit, and the different kinds of constructions happening in the block area swell as new children seek the experience of building their drawings. 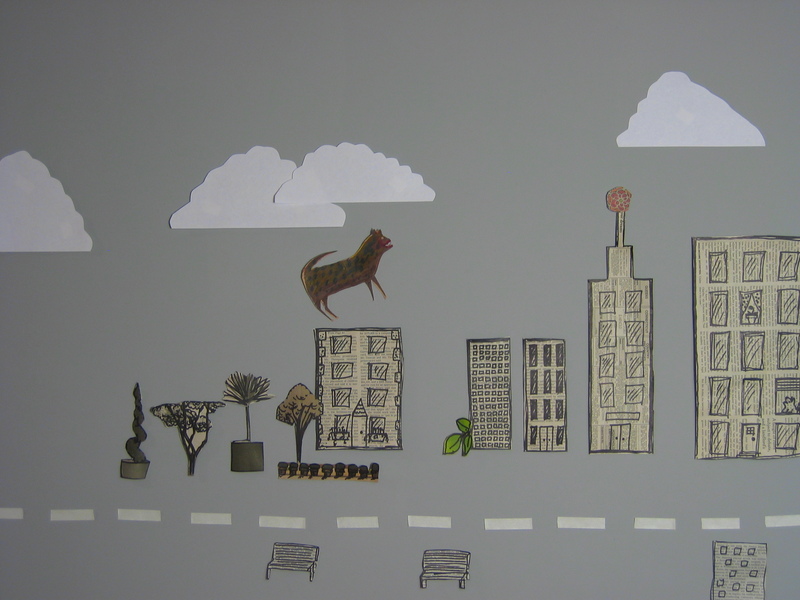 Themes that began in childrens’ stories and artwork now have a new form of expression. Documentation panels cover the walls in the blocks, showing childrens’ plans beside their finished constructions. The planning and reflective aspect of creative work is at the heart of the Reggio approach, and the art that comes from these preschools has deeply affected the whole world. The traveling exhibit, The Hundred Languages of Children, presents the quality of art that can be achieved when children plan, reflect and revisit their work. The resulting art is rich, complex, and imbued with layer upon layer of experience. I feel this stands as a strong testament to the need to encourage children at a young age to involve their whole brain in the creative process. The intriguing piece of neuroscience that backs up the Montessori presentation is perhaps the most fascinating finding of the last ten years, at least for me: the mirror neuron system (Rizzolati et al, 2002). From a small lab in Italy, the country where the Reggio Emila preschools were born, comes the finding that watching another human conduct a goal-directed action lights up the very same areas in a human cortex as actually performing the action. This mirror-neuron system resides in the motor planning areas of our cortex, and reminds us that much of our higher consciousness as humans comes from experiencing others’ action as our own. In other words, the work of the hands speaks volumes. I would venture that my students took information from the way Kristen’s hands moved when handling and explaining her plans that they could have never received through language alone. Howard-Jones contends that modeling creativity is a key element of teaching the creative process. Body language, facial expressions, spoken expression and concrete materials give students an embodied experience of the creative process, as well as a respect for those who provide it. Again, this is a controversial topic. It has in fact taken Kristen a little time to get comfortable with modeling her own creativity before our young and impressionable students. Will it skew their work, will make them want to copy her rather than chart their own course? I have stood firm that seeing the creative process is vital for the children. 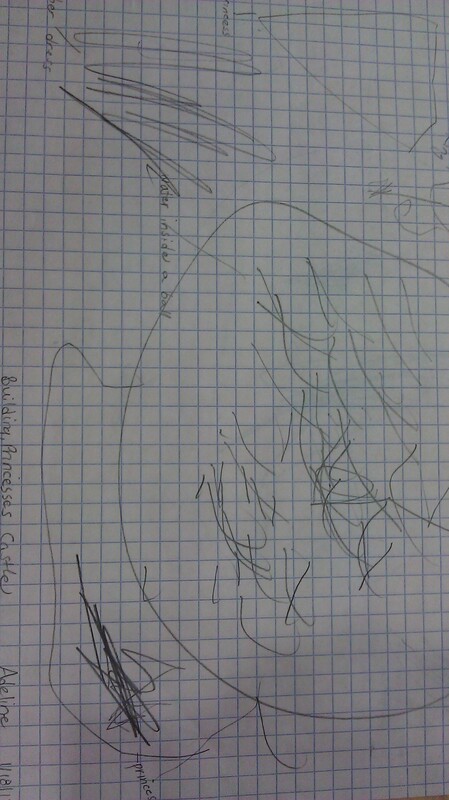 Something happens when my young students witness her process. It is something intangible, something about the expression on her face and the care she takes with her plan papers – a reverence and respect for her own work. This unspoken respect for the artistic process infuses the childrens’ work in the atelier as they sketch their ideas on graph paper, point carefully to the parts of their plans, gather materials from the shelves – and sit patiently, holding pieces of cardboard together while they dry. 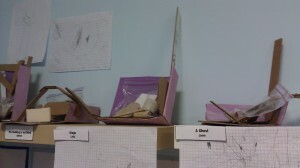 Sculptures are displayed on shelves in the atelier and block area, and tacked beside them are the plans on graph paper. Many sculptures are mothers – Mommy, mommy, and mommy in a yellow dress. Others are princess castles, or rocket ships, or race tracks. 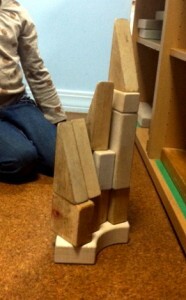 Adeline, age three, has titled her sculpture, The Building in my Mind. The plans hanging in the atelier are matched by other plans all over the Blue Room. On the wall of the Block Area are childrens’ drawings, Hannah’s owl among them, hanging beside photographs of finished block constructions. The Dramatic Play area, a subway station this month, is full of maps that children have drawn to guide their play. The remarkable finding is the same for all areas of the classroom: guiding our children to visualize ahead of time what they are going to make, build or even play allows them to hold onto their idea – and create it – with rich detail and language. 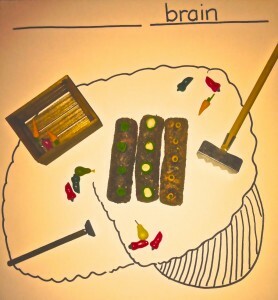 A major change is happening to the brains of my students as they turn three, a change that will forever set them apart from the rest of the animal species: the ability to create their own reality in the world based on an internal vision. I do not know if there is anything so fascinating as watching this ability develop in children. I am constantly reminded of human evolution – of the majesty of the earliest cave paintings and carved figurines of the human form. According to Howard-Jones, mental visualization provides the leap from the concrete to the abstract. 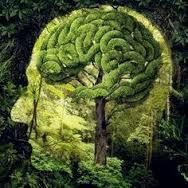 As humans, our frontal lobes have the ability to see something that is not yet there and then create it. As the frontal lobes develop in children, they acquire the ability, around age three, to remember, to sustain and manipulate information, to use imagination to create concrete miracles one can look at and hold in the hand. The interplay of the concrete and the abstract are very important at this time in development. The abstract is grounded in the concrete, and the concrete communicates the abstract. The most important and earth changing realizations began as a picture in someone’s mind – from planets revolving around a bright sun to electrons orbiting an atomic nucleus. Art is the method through which we communicate these ideas to other human beings when language will not suffice. To plan and then to make is the work of the human being – creativity. Yet, it is not an easy feat. As teachers, we are responsible for providing an environment where creativity can blossom. This is no longer just for the happiness of our students within the classroom – the creative ability is what is going to sustain and support our students in the future that awaits them after we are gone. In summary, fostering creativity requires teaching the intricacies of the creative process, modeling creativity, and the use of vision to guide work. It is worth noting that the core of the Reggio approach is the artist, the atelierista. Perhaps, more than we realize yet, the way the artist moves in the classroom, sees beauty in the most mundane materials, and creates beauty from the everyday is responsible for the most significant effect on the children. Reverence, respect and passion for creativity cannot be taught through words – this must be taught through the senses, the body, the creative mind at work. I invite you to end by listening to the illuminated poem The Hundred Languages of Children, and investigating the traveling exhibit of the Reggio Emila preschools. Please let me know your thoughts, ideas and impressions. Howard-Jones, P. A. (2008) Fostering creative thinking: co-constructed insights from neuroscience and education. Bristol: Higher Education Academy, Education subject center. Howard-Jones, P. A., Blakemore, S.J., Samuel, E., Summers, I.R., & Claxton, G. (2005). Semantic divergence and creative story generation: an fMRI investigation, Cognitive Brain Research, 25, 240-250. Howard-Jones, P.A., Taylor, J., and Sutton, L. (2002). The Effects of play on the creativity of young children. Early Child Development and Care, 172 (4), 323-328. Howard-Jones, P.A. (2002). A dual-state model of creative cognition for supporting strategies that foster creativity in the classroom, International Journal of Technology and Design Education, 12 (3), 215-226. Rizzolati, G., Fadiga, L., Fogassi, L., and Gallese, V. (2002). From mirror neurons to imitation: Facts and speculations. In A.N. Meltzoff & W. Prinz (Eds), The imitative mind: Development, evolution and brain bases. Cambridge studies in cognitive perceptual development (pp. 247-66). New York, Cambridge University Press. Today is the last day of 2011. We teachers are always away from our work when one year slips into the next, but nonetheless this is an important place in time for us. We have half our year behind us, half the year ahead, a rare space to reflect on how far we’ve come and what lies ahead. We need this refresh to gather ideas and inspiration, the creative energy we draw on keep things alive in the classroom. The first posts of this new year will focus on the topic of creativity. What is the importance of fostering creativity in children? How is it done? What does the brain research say? What approaches to fostering creativity have been shown to work in the early childhood classroom? Questions such as these were the focus of the 2009 Johns Hopkins University Summit on Neuroeducation: Learning, Arts and the Brain. A pdf copy of this book is available for download in Neuroeducational Resources titled The Dana Foundation on Learning, Arts and The Brain. The work contains some great work on a very important subject in the field of neuroeducation. Before diving in to these questions, I wanted to offer a glimpse into a project undertaken with my class of preschoolers over the course of two years, beginning in 2007. The Cheetah Project began nearly five years ago with the students at the Red Hook Playgroup collecting and sorting found items and materials that were no longer being used – but that they thought were beautiful. Our curriculum was based on Beautiful Stuff!, by Cathy Topal and Lella Gandini, an approach to fostering childrens’ creativity through work with found materials that was started by the Reggio Emila preschools in Italy. I will be exploring the Reggio approach and connections to research on creativity over the next months. The children spent time in small groups, building sculptures with these materials, learning about connecting, stacking and arranging materials in order to defy gravity and build “up.” A local teaching artist came in to guide us through our final project, building something together. It was a group decision to build a big cheetah. 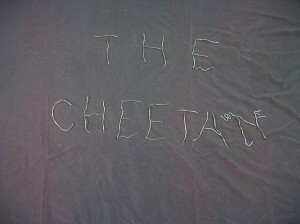 The Cheetah became a character for the children, and inspired a story about what would happen if he were to come alive. A year later we revisited our cheetah as a piece of art. We spent time just noticing its form, color, and the recycled materials we used. We talked about how we built the skeleton from wire, sticks and other hard materials, and then wrapped bubble wrap, wire and fabric around to make muscles and skin. The students noticed that its tail was once a Slinky, and its claws were once drinking straws! The cheetah’s story continued to evolve as we used the sculpture as the basis for new art throughout the spring. All parts of the process were carefully documented, including the childrens’ art, the written story narrated in their own voices, and finally their live story-telling. The finished project is a true collaboration between children and artists working to bring their vision to life. In the spring of 2009, childrens’ art was displayed for a month as part of a revolving local art exhibit at a neighborhood restaurant, the Hope and Anchor Diner. The film was shown at the closing, where members of the parent and local community came to see the childrens’ work. Take a look yourself. Click on the picture below to watch the film. I welcome your comments and ideas regarding the role of creativity in the young child’s experience.